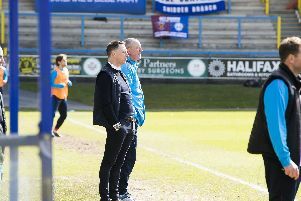 Relive the ups and downs of what has been been quite a year for FC Halifax Town. The Shaymen began 2015 on the verge of the National League play-offs under Neil Aspin, but end it in a relegation scrap after winning just 15 of their 53 games in the year. Darren Kelly holds his head during Town's 4-0 home defeat to Wycombe in the FA Cup. Halifax's 6-3 home defeat to Braintree a week later was his last in charge.